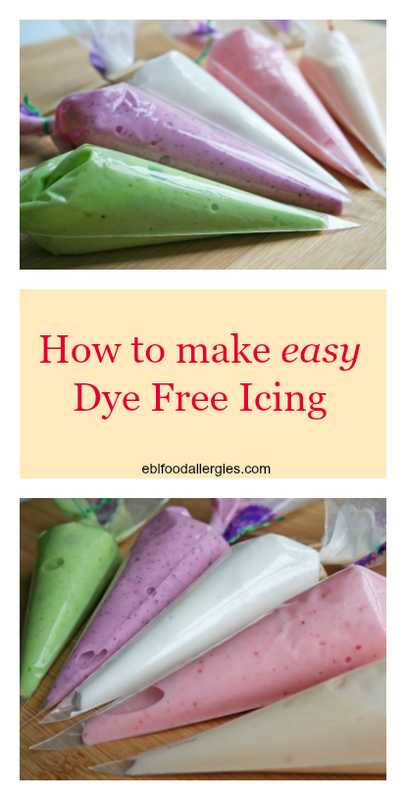 Dye free icing is fairly easy to make. This recipe is free of dairy, egg, gluten and all the top 8 allergens. It only contains sugar, rice milk, and whatever fruit or veggie I have on hand to color it. Feel free to use whatever type of milk you normally use in your house. The consistency of the icing all depends on how much liquid you add. Sometimes I want a drippy type of icing that I can pour on top of a cake and have pretty drip marks run down the edges. A drippy icing needs just a bit more liquid. Sometimes I want a firm icing so that I can decorate cookies easily without worrying about it running. A firm icing requires less liquid. I start with white. Simple. 1 cup of powdered sugar mixed with 1 Tbsp rice milk. Too runny? Add a bit more sugar. Too thick? Add a bit more liquid. 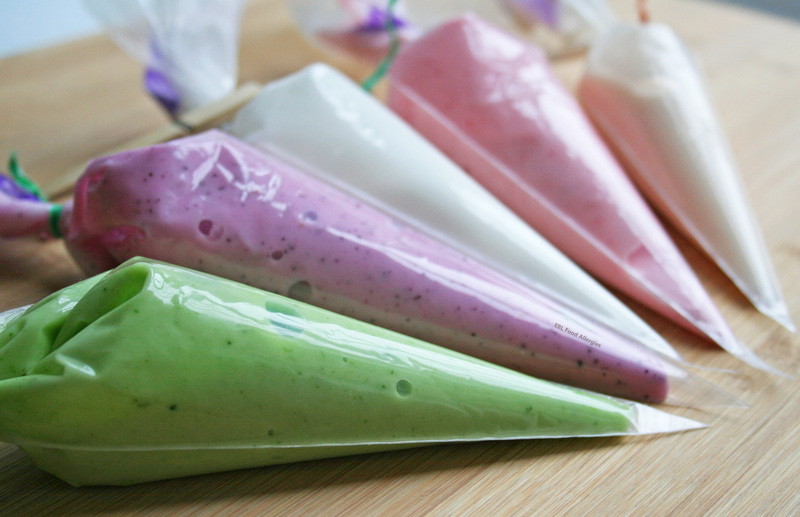 Blend until creamy and spoon the mixture into a piping bag. I then twist the end and seal it with a twist tie. Next is peach. The only orange thing that I had in my house was a cantaloupe. Carrot would have been perfect, but I made do with what I had. I blended 1 cup of powdered sugar, 1 Tbsp of rice milk, and a 1″ piece of cantaloupe (cut into pieces). Pretty in pink is next in the lineup. Blend 1 cup of powdered sugar, 1 Tbsp or rice milk, and 1 fresh strawberry (cut into pieces). Voila…pink! Green is easy peasy. Microwave 3 fresh spinach leaves with 1 tsp of water for 30 seconds and drain water. Blend 1 cup of powdered sugar, 1 Tbsp rice milk, and 3 spinach leaves and what do you get? Green! Purple is last up on the list. Blend 1 cup of powdered sugar, 1 Tbsp rice milk, and 4 blueberries. Do you still have icing left that you want to keep after decorating? Wrap the tips with a wet cloth to prevent the icing from drying out and clogging the bag. Feel free to use mostly any type of fruit or veggie to dye your icing. I would definitely avoid using any type of citrus fruit though. The acidity of the fruit doesn’t mix well with the icing. These dyes are so pretty and so super simple with ingredients that we have at home!! I love this!! I have always wondered how you can make icings. Now I know thanks to you. I’d use this when we make cupcakes. These are so easy to make.I am going to have to try these next time. Its nice how things come back around. Using fruits and veggie you had on hand was how they used to color frosting. I need to try this. I am trying to keep dyes and chemical out of my body. You had me at dye-free! Thank you for sharing this. It’s good to know we can do this without all that. 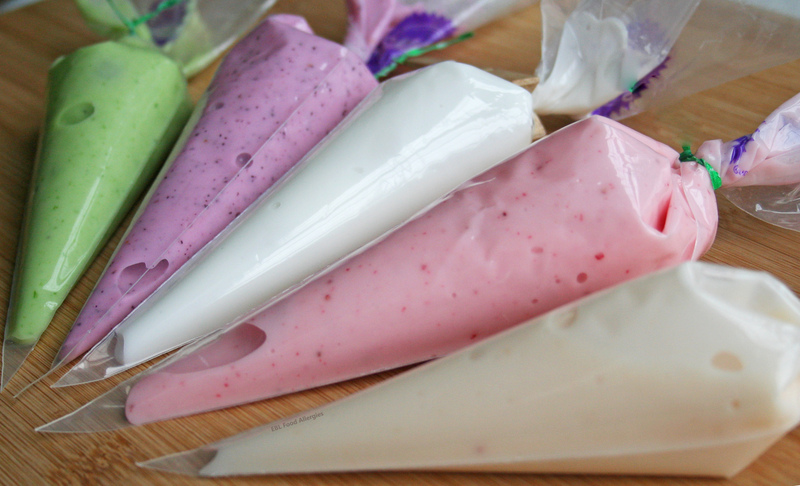 I’ve never made icings, didn’t know these are so easy to make! Seems like a great idea! Thanks for the recipe! Very nice and creative, love the colours too. Thanks for sharing! Those are really cute colors and I love that the icing is dye-free. We’re making Easter eggs using natural foods for color so we might as well make our icing dye-free as well. These are amazing! I’m not much of a baker but these make me want to give it another go so I can decorate some cupcakes. Such a great recipe to have in the arsenal when I have to make something for the kids at school. Dye free ice you make it look so easy to create. Your recipe is doable I know kids who would love this will share. That’s amazing! I love that you used fruits and veggies, that’s a very good idea. Thanks for sharing the recipe, all you need to do now is to get creative with the colors! That is so cute and amazing. What a great idea. Thanks! Sent this to my neighbor! Her one kid cannot have artificial dyes – it’s new and they are figuring it out! i always wants to learn how make homemade icing. Basically because I want to measure the amount of sugar that will pu into eat without sacrificing the taste. Plus the different variety of colors is a plus, Thanks you for this recipe. I’m so excited about this! I’m going to try these pretty icing colors right away. That’s pretty cool actually. I know some kids that have quite a few allergies so they have to stay away from certain things. Also good tip about staying away from citrus fruits for this recipe! 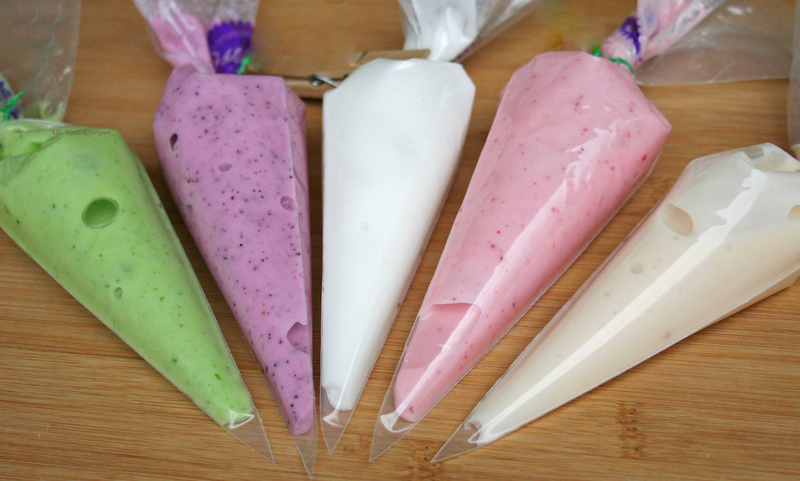 These different icings look so delicious! I love that they are a healthier alternative to the usual icing used on cakes and other desserts. These are so easy to make.I am going to have to try these! Thank you for sharing it! oh, my goodness! What an awesome idea. I would like to try this one. Thanks for sharing! I’ve seen carrot for orange food coloring but never cantaloupe! That is brilliant and I bet it tastes amazing. I absolutely love this recipe! I used raspberries to get a pink for icing Easter cookies and everyone went wild for it. Nice to have the slight fruit favour shine through.